On the subject of wine, I am on the receiving end of the same questions over and over again. The first, not surprisingly, is: “what is your favorite wine?” The answer is fluid, pun intended. My favorite wine varies depending on the weather, time of day, accompanying meal, and other factors. There is truth to the fact that wine in the United States is a luxury, no question. Nowadays, a good Pinot Noir (domestic or otherwise) will probably set you back at least $20. And considering the risk of buying something you will not like, its not an overly approachable retail market. Unless you have cash to burn, your first foray into the world of Bordeaux or Champagne is probably not going to be a $40, $30, or even $20 bottle for this very reason. But you do not necessarily have to pay to play. As with so many things food and beverage related, we are spoiled here in Boulder. As shown in the table below, just a handful of wine retailers around town will satiate your thirst 4 nights a week, and I am sure there are more that I am missing. Costing nothing but 10-15 minutes of your time, you can expect to try four different wines typically grouped by region, varietal, or by what is seasonal. Returning to the educational aspect, there is no better way to determine out your preferred Pinot Noir style than to try a sample from Santa Barbara, Sonoma, Willamette Valley, and Burgundy all in the span of a few minutes. Similarly, free tastings are great for those who have strong opinions wine and need a bit of encouragement before trying something that they think they will hate. I despise oaky Chardonnay, but my only risk at a free tasting is some temporarily agitated taste-buds. Some people tell me they do not like attending free wine tastings because they feel an unspoken obligation to buy something. In truth, most of the time I do end up buying something. But I do it because I like one or more of the selections, because the featured wines are usually discounted 10-20%, and because I’ve developed good relationships with those pouring the wines and appreciate them offering their wares to me. But in truth, as long as you are attending with the right intentions (education, intention to buy, etc.) instead of just trying to get a free buzz, there is really no reason to feel uncomfortable. From the retailer stand-point, it is a way to invest in the consumer. They know that a random patron is much more likely to purchase a more premium wine if they know what to expect. It’s truly a win-win for both parties. I’ve listed a few of my favorite weekly wine tastings below, but please leave comments about your favorite tasting, or if there is a tasting I should add above. I’m always looking to diversify my wine tasting circuit! As is true with all of their products, the selections that B-town offers during their tastings are hand-selected and represent great values for the price aided by the fact that they usually feature wines that cannot be found elsewhere (to my knowledge) in Boulder. 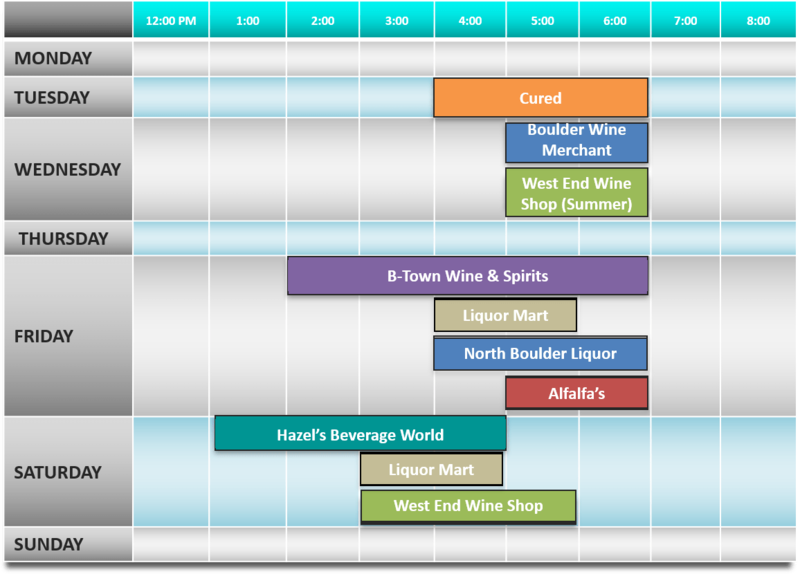 If you live in central Boulder like myself, it is perfect to be able to stop by the Video Station for a movie on a Friday evening, and then try some wine without going out of your way. After all, you’ve got to pair something with your buttered popcorn. I cannot really do this segment adequate justice- as a wine lover, the customer offerings at The Boulder Wine Merchant are exceptional. The staff at the Boulder Wine Merchant usually pick a wide range of wines (both in price and in style) for their tastings, but they rarely disappoint. It is not uncommon to taste a $15 Riesling alongside a $75 Brunello during the same tasting. Furthermore, if you follow their newsletter, you’ll often see random tastings on other nights of the week with outstanding producers such as Gaja and La Spinetta. Finally, usually once a month Master Sommelier Brett Zimmerman offers a free wine education class on a particular region or style where you are likely to be blown away by a grape varietal you have never heard of. Great article Beau, Thanks for the mention. Wanted to let your readers know Hazel’s also does tastings on Friday from 4-7pm and if they ever want to expand their drinking horizons past wines we usually have beer and spirits each weekend too!